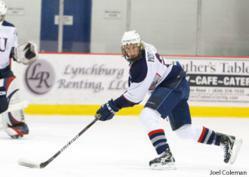 Liberty University’s Mike Morrison recently became the second Liberty hockey player to sign a professional contract. The defenseman from Oakville, Ontario will be playing for the Dunedin Thunder, a team in the New Zealand Ice Hockey League. After graduating with a degree in kinesiology, Morrison will fly to New Zealand on May 13 to begin practicing with the team. During his five years with the Flames, Morrison has played in 134 games and posted 13 goals and 49 assists for a total of 62 career points. “Without me going to Liberty and developing my skill, I don’t think I’d be able to take the next step and go play,” Morrison said. He first came to Liberty to attend a hockey camp while in high school. Although not planning on attending college after high school, after meeting with Liberty coaches and skating with current players, he changed his mind. He made the Division I team as a freshman. Beyond participating in daily practice and weekly games in New Zealand, Morrison is also looking forward to representing God and Liberty. Morrison is the second player in Flames history to sign a professional hockey contract. Liberty’s current Division I assistant coach, Mike Binnie, signed with a Russian team four years ago. Liberty’s Club Sports program offers 29 teams, including men’s Division I, II and III hockey and women’s Division I and II hockey.